Stone Sour have announced a deluxe edition of their 2017 album Hyrdograd. The new version will feature a total of 27 tracks, including all 15 songs from the album along with 12 previously unreleased covers, b-sides, alternative versions and live cuts. And to mark the announcement, Corey Taylor, Josh Rand, Roy Mayorga, Christian Martucci and Johny Chow have released a lyric video for Burn One Turn One, which originally appeared on the Japanese version of the album. Watch it below. Speaking about the record, frontman Taylor said: “This album is great because it’s got elements of everything. It’s got the heavy energy of the 80s, there’s punk moments, there’s hard rock moments – all the great amalgam of music. 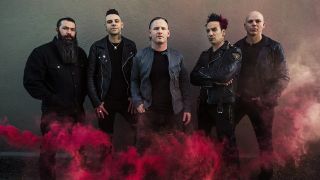 Earlier this month, Stone Sour announced a run of North American headline shows which will take place between dates supporting Ozzy Osbourne on his farewell tour.